The application period is now closed. Scholarship awards will be made in April 2019. Peary Wilemon was a long-time agricultural and civic leader from the central Texas community of Maypearl. He left college to take over his family's cotton farming and ginning operation in 1928. For many years, Wilemon led the cotton industry in technological advances to improve ginning efficiency and fiber quality. He was elected President of Texas Cotton Ginners Association in 1958 and was named Texas Cotton Ginner of the Year in 1961. Wilemon served as Secretary-Treasurer of National Cotton Ginners Association from 1961-1986, while operating his farm and gins and holding a number of civic posts in his community. Under Wilemon's guidance, National Cotton Ginners Association served its membership through a variety of programs and as an advocate for the ginning industry in Washington, D.C. Encourage young people to join the cotton ginning industry, while equipping them for service through gin-related college studies and graduate research programs. Through the use of scholarship funding, establish a partnership with universities that will direct their teaching resources and research efforts toward gin industry priorities. Through systematic planning to define current and long-term priorities, engage the scholarship recipients, both student and university, to address specific industry research needs. Honor the dedicated industry service of Peary Wilemon, who was the mainstay at National Cotton Ginners Association for over 25 years. Please note that applicants must have all documents submitted by February 1 and be at a minimum university sophomore level for their application to be considered. State/regional gin association members' help is needed in raising additional support for the Peary Wilemon-National Cotton Ginners'Scholarship Foundation, including publicizing the funding drive. 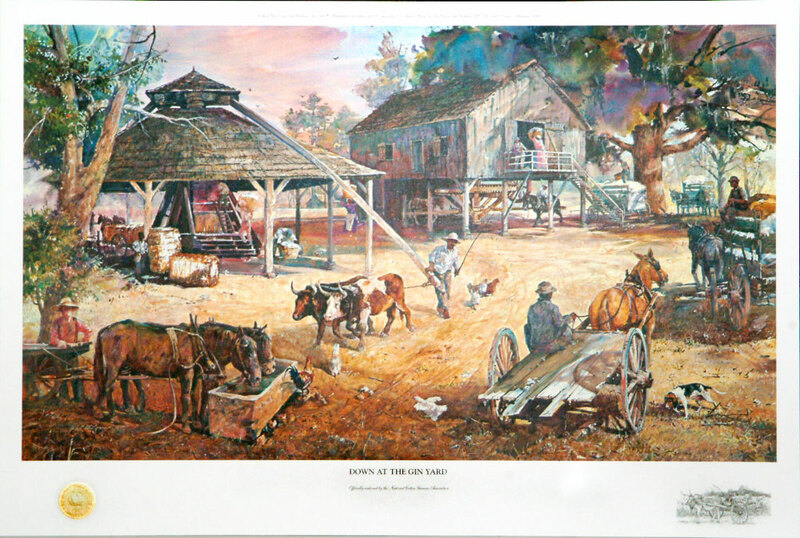 Jack Deloney graciously made available signed “Down at the Ginyard” prints for those individuals who contribute a minimum of $500 to the Foundation.